The daily round of prayers recited by monks (divine office) drew upon a number of different kinds of books: the psalter, Bible, hymnal, and collections of stories of saints' lives. The latter contained accounts of the deeds of the saints that marked them holy people. Excerpts from a saint's life might be read as part of the office on his or her feast day. 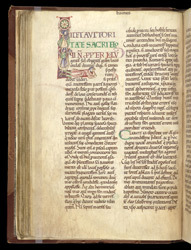 This English martyrology or passional was made in the early 12th century for the monastery of St Augustine, Canterbury. Few contemporary English passionals have decorated initials (letters beginning a section of text), and this one has ingeniously designed decoration which may present a saint's story within the initial's interior. An account of the miracle of St Bavo or Bavon, whose feast is 1st October, begins with a historiated intial (first letter bearing a picture). St Bavo or Bavon was an early 7th-century saint of the Low Countries who gave his land to St Amandus to found his monastery at Ghent. The wealthy, spoiled Bavon turned from his previous lifestyle to become a monk. Rebuilding churches (an example shown in the initial) and foiling pagan Northmen were feats he accomplished posthumously.